Clutter…. what is it exactly? A magazine collection since 1958. It is the home with a room you do not enter – the room that houses all you need to sort through ‘one of these days’…. It’s the many trinkets and gadgets kept and saved for ‘just in case’…. And it’s the ‘STUFF’ we purchase…. The stuff we think we need… to fill a void, create a temporary emotion that fills our home and our days…. Who is tired and overwhelmed just thinking of this list above?? I wonder what home would look like without clutter? What our days would feel like? What freedom we would experience if we were not being consumed by our clutter and STUFF?? Spring is an opportunity to bloom into our new possibilities. This year in 2018, it is particularly important, as it is a year of creating great change in our life and career path where it is needed. Clearing out our clutter this year is the greatest beginning in creating and inviting change and clarity. A gift to feel lighter, have more energy and action a life of greater wellness and purpose. 7 STEPS TO GET YOU STARTED…. 1. Begin with a space clear. This is the most important step to get some clarity and motivation. Space clearing dissolves all the mental clutter and emotions in the home. The memories oF your household items, the energy of your conversations, the mental monkey mind that never sleeps. With this removed from your home – you will be able to see that the decluttering task at hand is quite simple really! It is seen as a physical ‘job’ or task, without the mental overwhelm and enormity! Smudge with sage and Palo Santo to remove the heavies – the old and outdated. Spray clearing spray to reset the energy and invite an intended emotional state of mind. For notes and video demo on how to space clear, see this post here or for more products visit the shop. 2. Take a moment to visualise and organise how you are going to set the spaces in your home. For example – if you have ‘work stuff’ stored in a few different palaces around your home – look at which space can be used to house all ‘work stuff’ – then look at how much storage is needed in that area, after the decluttering process is complete (you may be surprised at how little there is to store and house once you have completed the decluttering process!). 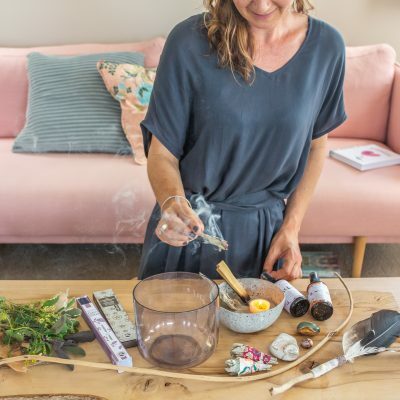 When we organise our home into designated spaces to house each activity, we create harmony and flow in our homes – when there is a little bit of this and that throughout our homes – we create scattered and overwhelmed energy. 3. Start with a space that annoys you the most – the one you feel motivated and an urgency to unpack and pull apart! This space may not necessarily be the one you think you should start with – however, you need to trust that it is the right one for you to get life moving..
4. Have boxes and bin ready!! Bin – for rubbish clutter; box for salvos or sell; box for keep to house in its new home or space. At the end of your decluttering day or hour, make sure the rubbish goes out and the box is in the car ready to drop to the salvos the next time you venture out. If this is not done – there is more chance it will end up in the garage or another room or back in the cupboard! 5. Start small – Begin with a shelf; a draw; a basket…. Or maybe a cupboard or table top. When you feel a sense of achievement and your flow, you will be able to carry on without creating energetic clutter overwhelm. Be gentle on yourself when you declutter – particularly if you decide to embark on a room or area of the home that has been cluttered for some time. 6. Ask for support. Share the decluttering process with a friend if this exercise is overwhelming. A healing or nlp session is also a remarkable way to get you started too if you are really in a spot of declutter bother. 7. Hold onto a vision of how you would like your space to feel and what that would look like – Hold the feel or image of a clean draw or cupboard – a new fresh room or peaceful workspace… and imagine your home being able to BREATHE… make that CHOICE to go for it, and get movement happening NOW!! Look at the north area of your home…. What lives there – which room – or area – what contents are in it and how do you feel upon entry?? This area is our career and life path sector in Feng Shui. An area of our home that symbolises our life path and working career. Clearing and de-cluttering our career sector for 2018 helps us to invite changes needed…. A new job; leaving an old job; beginning a dream you have had for many years; or maybe it’s time to honour self, see the self and begin to make life changes for wellbeing and thrive!! Look at the west – your goals and projects sector. What is in this space? What can you bring into this space to create vitality and thrive? What can you remove form this space that is old and outdated?? 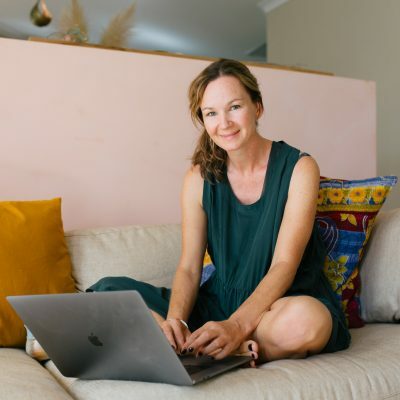 If you would like to understand the story of your home a little more – understand why you hold clutter in certain areas of the home or if you would like to simply get to know your home more…. Book in a Feng Shui home consultation – I recommend starting with a Feng Shui verbal report. Or book into our seasonal Feng Shui workshop!